Do you want to show basic system information of the computer on desktop screen? While this may not be of much use for single computer workplace, it is essential for multiple computers workplace. 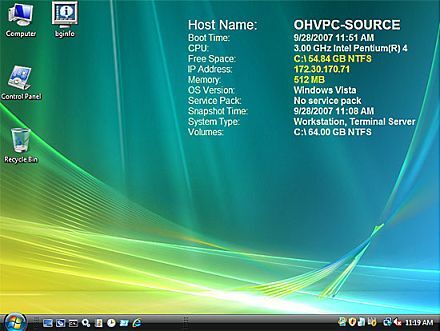 BgInfo is a handy utility that displays basic system information on desktop or background screen of each computer or workstation. Ideally, one has to navigate through different Window settings to see System Information details. With details on the desktop screen, one can see them in a quick glance at the screen. It displays lot of information on desktop screen including: host name, boot time, CPU specs, free space, IP address, memory, OS version, service pack and much more. Download BgInfo to show basic system information on desktop screen with ease.